It's hard to get mad about all the absurd national food holidays when they routinely result in free food and wild, delicious culinary concoctions. So, give a little love to a day that won't get the kind of love National Taco Day or National Pizza Month gets. November 18 is National Apple Cider Day, and good things are coming your way. Angry Orchard and New York City's The Doughnut Project have gone full Captain Planet, combining their powers to create something more than the sum of their parts. The result is the Angry Crisp Doughnut. It's a hard cider apple crisp doughnut. The Doughnut Project has created the doughnut with a bit of Angry Orchard's Crisp Apple cider. The doughnut will be available at The Doughnut Project's shop in New York's West Village, as well as the Angry Orchard Cider House in Walden, New York. This isn't the first time The Doughnut Project has dabbled in booze-inspired doughnuts. It has previously cooked up Prosecco doughnuts and a series of cocktail-inspired doughnuts, among other delicious sugary treats. If you think this whole situation is very unfair because the doughnuts are too far away from your mouth, you're right. However, there's a silver lining. 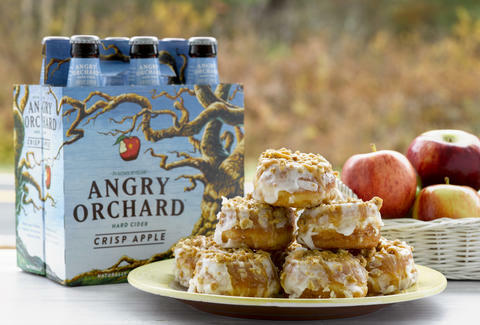 Angry Orchard and The Doughnut Project have shared the recipe, so you can make your own hard cider pastries. It's basically a guaranteed way to be the most popular person in your home.